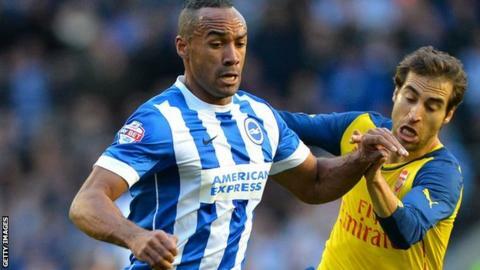 Brighton striker Chris O'Grady says doing yoga immediately before kick-off is the perfect preparation for a match. The 29-year-old has made over 360 league appearances during the course of his 12-year professional career. "It's something I've done for probably 10 years now before each game," he told BBC Sussex. "While centre-halves in the other changing room are not doing much, I'm making sure I'm as flexible as possible to go into the game and do battle." He added: "When it comes down to it, from the first minute I'll be more ready than the opponents." O'Grady, who has had spells at 13 different Football League clubs, took up yoga after former Manchester United winger Ryan Giggs used it to prolong his career. "Ryan Giggs promoted it a few years ago and I suppose I just got on that bandwagon," said O'Grady. "I couldn't think of a more inspiring footballer, after the career he had. It definitely helps." Former Bolton striker Kevin Davies and Wycombe midfielder Matt Bloomfield have incorporated yoga into their training, while cricket legend Sachin Tendulkar and boxer Darren Barker have also been advocates. O'Grady, who has scored two goals in 18 appearances for Brighton since joining last summer, began practising yoga when he was in the youth set-up at Leicester City. "I was a young lad and was quite big but not very flexible," he said. "It led to injuries at the time so I knew I needed to do something. "I did yoga and all the injuries went away. I've never really had a muscle injury since." Meanwhile, Brighton Under-21 captain Glen Rea has extended his contract with the Championship side until 2016. The 20-year-old defender is yet to make his senior debut, but has been named as a substitute four times this season. The Sussex-born player has been with the Seagulls since he was 10 and has represented the Republic of Ireland at Under-21 level.